Just as you give a child taking his first steps a push to encourage him to walk, today we need to push youngsters into the streets with a camera, into the midst of things!" A collage of little seen shorts directed by some of the leading Italian Neorealist-directors L'amore in Citta a.k.a Love in the City (1953) is the latest offering by Minerva Classics-Italia. Amore Che si Paga a.k.a Love for Money (11 min) directed by Carlo Lizani with a screenplay by Cesare Zavattini. A mosaic of scattered images where the night workers are followed by a man with provocative questions-the short feels as an interview where the women explain their unfortunate profession. Tentato Suicidio a.k.a Attempted Suicide (22 min) directed by Michelangelo Antonioni with a screenplay by Cesare Zavattini. A heartbroken woman contemplates suicide after her life has unexpectedly crumbled. Desperation quickly takes over and the unthinkable becomes a possibility. Paradiso per tre ore a.k.a Paradise for Three Hours (12 min) directed by Dino Risi with a screenplay by Cesare Zavattini. A loud dance party brings comfort to a man and a woman too shy to join the celebration. They observe the games men and women play and eventually leave the hall. Agenzia matrimoniale a.k.a Marriage Agency (16 min) directed by Federico Fellini with a screenplay by Federico Fellini. A young journalist preparing an article on arranged marriages pretends to be a customer looking for a bride for his rich client. He sees a poor Italian girl willing to become a housewife even though she is told that the client and future husband is a werewolf. Storia di Caterina a.k.a Story of Caterina (27 min) directed by Francesco Maselli with a screenplay by Cesare Zavattini. A poor woman from Sicily moves to Rome looking for a better life. Her plans quickly take a dive as she could not secure a job. The woman is forced to abandon her son in the local park as she could no longer take care of him. Gli Italiani si Voltano a.k.a Italians Turn Their Heads (14 min) directed by Cesare Zavattini with a screenplay by Cesare Zavattini. A collage of candid camera excerpts focusing on men observing and responding to the presence of beautiful women. Inspired by Cesare Zavattini L'amore in Citta is misleading in its proclamation of love. Stripped of excessive glamour the films in the collection focus on investigating the darker side of a compromised social system and those caught in its web: prostitution, unemployment, extortion are a few of the themes the Italian directors address. "Reality", a key fragment in this project, is practically untouched by the hands of the film editor. The director's camera is used as an "observer" whose only mission is to capture a fragment from the lives of the main protagonists (a predominant amount of them are non-professional actors even though some true icons of Italian cinema such as Ugo Tognazzi, Maressa Gallo, and Caterina Riogoglioso among others also participated). Logically, each story is nothing more than a document acknowledging life on the streets of Italy. As described by Zavattini L'amore in Citta is an episodic film. Here the only reappearing motif is verism (the logical next step of realism) as seen by the camera. Relationships or secondary plots are practically unimportant to the message the directors attempt to convey even though each short offers a dramatic resolution. 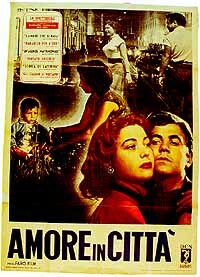 Finally, L'amore in Citta does not judge the actions of those whose lives are captured by the camera. On the contrary the film invites the viewer to ponder reality by remaining silent. Slogans or political statements are nowhere to be found even though the narrator's questions are indeed suggestive. In the massive booklet provided for this DVD release there is a note announcing that the owners of the original print, Studio Canal and Minerva International Group, with the assistance of the Municipality of the city of Rome, have performed the best possible restoration. I agree. The film is presented in its original aspect ratio of 1.33:1 and it looks fabulous. Excellent black and white gradation, equally impressive contrast, lack of annoying flickering, and a very balanced look is what we here. The restoration note mentioned above also states that the final fragment from Antonioni's short was initially erased by the censors and Minerva had to go an alternate route to present the film in its complete form. With the assistance of the Italian National Film Library and Cinecitta Studios the final version of this project was assembled. I mention all of the above as once again I am utterly impressed by the expert restoration work Minerva have provided. This DVD clearly is amongst the best in their catalog and the love and care the Italian distribs have put into it shows! PAL-encoded, Region 2. The audio presentation appears to have undergone the same meticulous restoration work the video department reveals. I am however slightly puzzled by the presence of some low-noise during a few of the outdoor scenes. As I have never seen or owned this film prior to this R2 DVD I must assume that this is how the film originally sounded. Aside from that the Italian DD track is fabulous. With optional, very well done, white and of proper small font English subtitles. In addition to a massive 34-page booklet which is translated into English (the booklet contains English-friendly critical essays, anthologies, and comments by the directors) the DVD offers an audio-commentary in Italian only, a theatrical trailer, and Paolo Mereghetti, Luca Bandirali & Angelo Pasquini (Italian with optional English subtitles). These are great pieces as they deconstruct the nature of Zavattini's project, the use of music, and ultimately the technical issues the directors encountered while filming their realistic stories. An extreme example of Italian Neo-Realism L'amore in Citta is an interesting project whose formidable body of directors is just as impressive as the shorts they contributed with. The extras supplied by Minerva Classics are fantastic, shedding plenty of light on Zavattini's creation. Highly-Recommended.